One of the major activities of AAHF is publishing translations of old manuscripts into English. This is the second publication in the bulletin series of AAHF. 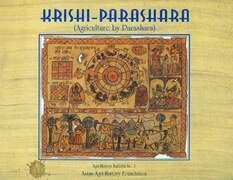 The present manuscript (in Sanskrit) is taken from the book, Krishi-Parashara, translated into Hindi by Chaudhary Srinarayan Singh in 1971; the AAHF obtained it from the Bhandarkar Oriental Research Institute, Pune, India. The Sanskrit text was rewritten by hand by Mr. Prabhakar R Jogdand. Dr. Nalini Sadhale has translated the Sanskrit text, giving her own commentary. Two or more commentaries on the text are also included in this bulletin. The AAHF acknowledges the significant contributions made by S.M. Sinha, Sheila Vijayakumar, S.M. Virmani, S. Lalitha Annapurna, and Asim Aleem in designing, editing, and typing this Bulletin. She obtained MA in Sanskrit with distinction from the University of Poona, India and PhD in Sanskrit from Osmania University, Hyderabad, India. She has had a distinguished professional career and she retired in 1994 as Professor and Head of the Department of Sanskrit, Osmania University, Hyderabad. She distinguished hereseld by serving on several prestigious organizations, committees and boards. She worked as Sastra Chudamani Scholar of the Rashtriya Sanskrit Samsthan, New Delhi, India. She has several publications which include Katha in Sanskrit Poetics, Sanskrit Verse Translation of Hindi Tulsiramayana, Translation of Urvashi and Vasantsena from Sanskrit to Marathi, a Marathi translation of Telgu play by Narla V Rao, and translation of Surpala's Vrikshayurveda from Sanskrit to English.